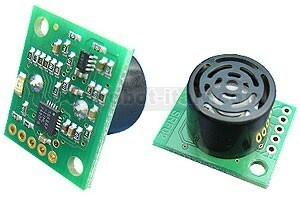 The SRF02 is a single transducer ultrasonic rangefinder in a small footprint PCB. It features both I2C and a Serial interfaces. 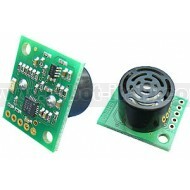 The SRF02 is a single transducer ultrasonic rangefinder in a small footprint PCB. It features both I2C and a Serial interfaces. The serial interface is a standard TTL level UART format at 9600 baud,1 start, 2 stop and no parity bits, and may be connected directly to the serial ports on any microcontroller. Up to 16 SRF02's may be connected together on a single bus, either I2C or Serial. New commands in the SRF02 include the ability to send an ultrasonic burst on its own without a reception cycle, and the ability to perform a reception cycle without the preceding burst. This has been as requested feature on our sonar's and the SRF02 is the first to see its implementation. Because the SRF02 uses a single transducer for both transmission and reception, the minimum range is higher than our other dual transducer rangers. The minimum measurement range is around 15cm (6 inches). Like all our rangefinders, the SRF02 can measure in uS, cm or inches.